The Roman Emperor Hadrian decided to Hellenize Judea by integrating the Jews into the empire during his tour of eastern part of the empire in 131 CE. As the first step, he prohibited circumcision of male children till they reach the age of consent. And he decided to build a Roman city Aelia Capitolina on the site of Jerusalem. Jews found this to be offensive. A charismatic leader of Jews, Simeon of Davidic descent led the revolt against Roman authority in 132 CE. Simone was hailed as the Messiah by the rabbi Akiva ben Yosef and gave him the title Bar Kokhba (Son of the Star). Simeon Bar Kokhba took the title nasi (prince). Simeon Bar Kokhba minted silver sela, zuz and bronze coins. Probably due to a shortage of metal and time, the silver coins were usually overstruck on earlier Roman denari. 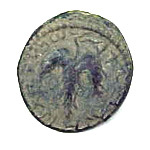 Coins were struck with the legend Year one of the Liberty of Jerusalem. According to the roman historian Dion Cassius, Jews badly defeated Egyptian Legion, XXII Deiotariana of Roman army and took control of Aelia Capitolina (Jerusalem) in 132 CE. In 134 CE, Hadrian summoned Gaius Julius Severus, then governor of Britain with 35,000 men of the X th Legion to the Judaea. Jerusalem was retaken in 135 CE and Bar Kokhba was killed at Betar, his stronghold in the southwestern part of Jerusalem. The Jewish army was crushed and the Jewish population of Judaea annihilated. More than half a million people were killed, according to certain accounts and another half a million estimated to had died of starvation and disease. Roman army also took a heavy toll. Jews were barred to enter Jerusalem thereafter except for one day of the year (Day of Mourning). After the war, province of Judaea was renamed Syria Palaestina. Hadrian converted Jerusalem into a Greco-Roman city in 135 CE with streets conforming to the Roman grid pattern. He built a circus, an amphitheatre, baths, and a theatre. He also erected temples dedicated to Jupiter and himself (Aelia was his clan name) on the very site of the destroyed Second Temple of Jerusalem. 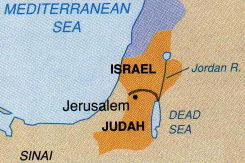 Judaea remained under Roman rule until it fell to the Islamic armies of caliph Umar I (634 - 644 CE) in 638 CE. Bronze 25 mm. First Year of Bar Kochba War(132 CE). Obverse: A bunch of grapes with a Hebrew legend around. 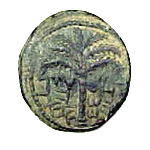 Reverse: A palm tree with eight branches. Silver zuz 18 mm. First Year of Bar Kochba War. Obverse : A bunch ofgrapes with a Hebrew legend around. Reverse : A Lyre with the legend For thee freedom of Jerusalem in Hebrew.